This has been an exciting week in our monastery! 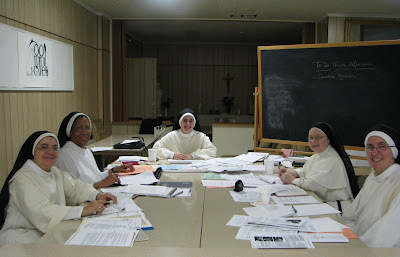 From the 12th to the 14th, the Formation Committee which is comprised of Sr. Mary Catharine, Sr. Mary Martin, Sr. Mary Jeremiah, Sr. Anna Marie (Elmira) and Sr. Mary Veronica (Lancaster) met to tackle the important work of planning for formation at various levels for the monasteries of our Association. Certainly the Holy Spirit brought not only the gift of unity but the ability to finish what they had set out to accomplish. When Sr. Mary Catharine handed out the agenda the general reaction was, "We'll never get to all this!" But they did! Fr. Dominic Izzo, friar-consultant, juggled meetings and commitments to attend the meeting Thursday morning. His brotherly presence and clear-thinking are always so appreciated by the nuns even if sometimes it looks like he is outnumbered! Now the sisters need to sort through their many notes to send their report and proposals to the Association Council for approval. It was a special joy to have both Sr. Anna Marie and Sr. Veronica Mary with us for a few days. Sr. Mary Catharine did her best to plan the meeting schedule so that the sisters could have time to be with our community outside of prayer times and meals. At recreation one night, Janlyn and Sr. Anna Marie were in heavy competition as to who would win the game Sequence. Meanwhile, Sr. Maureen, Sr. Judith Miryam and Sr. Mary Jeremiah were engrossed in a puzzle they had started. Sr. Mary Veronica? She was just trying to catch up on monastery doings with the other sisters. The Dominican charism is very much a family spirit and welcoming sisters from other monasteries is evidence that this is true. We all do things a bit differently from monastery to monastery but the essentials are the same. Obviously, Sr. Judith Miryam found the puzzle piece she was looking for while Sr. Mary Jeremiah and Sr. Maureen contemplate the box cover! Last evening, the Sister who is refectory reader for the week read the martyrology and a short life of Bl. Lucia of Narni, a 3rd Order Dominican who was also a cloistered sister. We spoke about her in an early blog entry HERE. As you may know, Bl. Lucia was deposed as prioress and spent the next 39 years of her life in the monastery dungeon allowed to speak only with her confessor. One of the committee sisters whispered under her breath, "It sounds wonderful! No meetings!" Sister's wish will come true—sort of—for this week our community will be in retreat from November 18-21st as we prepare to celebrate the feast of the Presentation of Mary on November 21st. This day is set aside by the Church as "Pro Orantibus Day"—for those who pray. On this day the Church remembers in a special way all men and women who are dedicated to the hidden search for God, interceding on behalf of all people for the salvation of souls. This day is extra special for our monastery because on this day 55 years ago, our community received the privilege of making Solemn Profession and full incorporation into the Order of Preachers. This year, Fr. Roger Landry, a friend of our community, will preach our retreat. Also, there will be no shipping of orders from the online gift shop on these days although you still may place orders. We thank you for your understanding! A Welcome to Our New Pastor!